After a great Mixed Tour season last year we came into this – newly structured – season looking to build on our first foray into the top 8, and keep ourselves in and around the top of the Mixed rankings. For the first event of the year we started seeded 4th, with a very tough looking pool to welcome us. 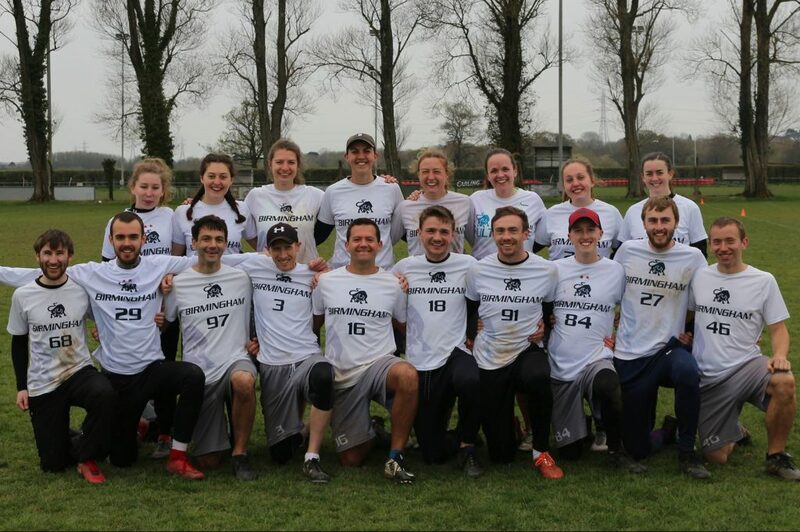 In the first game of the season we matched up against the potentially daunting MPA, a ‘new’ team made of mostly Chevron men and Bristol women. This turned out to be a bit of a baptism of fire for some of our newer recruits and any mistakes we made were swiftly punished. We got turnovers throughout the game, and looked dangerous on O, but some simple errors at crucial times stopped us building any kind of momentum and they took it away from us. Even though they ran out 4-15 winners, we had proven (to ourselves) that we had the potential to play at the top level and if we were able to cut out some of the errors the game could have been closer. Next was another potentially daunting game, against Deep Space. Their huge squad of well drilled and experienced players presented a different challenge, but we started well as both teams fought to establish their game. Each time it looked like one team might have the momentum, the other battled back. Eventually however, they did manage to get a bit of separation and held on to take a 10-14 win, leaving us bottom of the three team pool. That left us in 11th, with the task of defending our 11th place before there was a chance to get back in to the top 8 on Sunday morning. The other two teams from our pool went on to finish 3rd and 4th overall. Our crossover opponent in the 11v14 game was EXƎ. It turned into a similar game to the Deep Space one in some ways, where neither team were able to fully take control; every time we took a slight lead they found a way to peg us back. We were playing from in front this time around though, and we managed to keep the slender lead we had intact long enough to see the game out 11-9. After a rest overnight we came back on Sunday morning eager to push back into the top 8 and with a game against Cambridge 1 to do it. Both teams came out ready and it was clear this was a battle from the beginning. Over the course of the game our D got better and better though and the pressure started to show as we built a lead. Our second half was particularly strong and we pulled away to a 15-4 win even though it felt tighter on the pitch. Our reward for getting back into the top 8 was a game vs Reading 1. They started much better than we did, and took an early lead as such. We dug in though and, using our zone to slow them down, played our way back into the game. As we brought it back level though, they stepped things up again and took another few points in a row to re-establish the lead. Once again though we rallied, and strung a few points together of our own to take our first lead of the game at what seemed like a crucial time. From there we didn’t let up and as we entered the cap we held a 12-9 lead. Despite having the disc on their endzone line numerous times in the next few points we were suddenly wasteful and allowed them to come back into the game when we really should have put it away. At 12-12 we once again gave them the disc and despite good pressure on D they converted to take the game from us. That result left us in the 7v8 final against the Ireland Mixed squad. Due to their flight schedule the game was shortened to 50 minutes and as you would expect they came out firing right from the off; using really crisp give and go’s to march up the pitch in devastating fashion. Even at this stage of the weekend though we didn’t roll over, our D stepped up once again and started to make them think twice about options, slowing them enough to force some turnovers and get us back into the game. As we clamped down on their short game they started using the deep shots more and, despite our pressure, were able to keep the scoreboard ticking over. With the shortened game this was enough to keep us down, as they took a 6-9 win. Overall it had been a great weekend, one where we’d had to battle hard in every game, but each time we showed great determination and fight against some of the best teams around. Some of the results may not have been what we wanted but all things considered 8th place is a really good result and with the lessons to be learned from the weekend in mind we will be looking to come back even stronger at the next event!